Floor lamps provide consumers with a convenient means to upgrade the lighting in a given space without having to drill holes into walls or ceilings. These lights can be used to provide both functional and ambient lighting, whichever the intended application requires. Are you looking for a floor lamp but don’t know where to start? Floor lamps are a great way of giving light to a room and can also be used to design a vacant area. 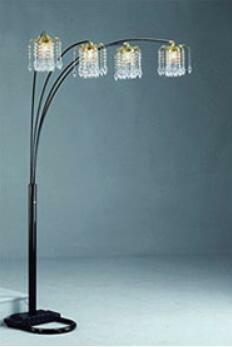 Of course, there are various kinds of floor lamps that you can choose from. It depends on how much light you want for your room, the size of the room also matters, and what design you prefer to have since it can also be used to decorate your home. The right floor lamp can give you the best lighting for your living room, bedroom, or even for your office. If you research online for floor lamps, you’ll see that each one has different features that you can use. Knowing these features and each lamp’s differences can help you evaluate which one to buy for your lighting needs. Here are three kinds of floor lamps that you should buy and their benefits. Natural lighting is important in our homes and lamps that have this feature are one of the best options that you should consider. Floor lamps that have natural lighting will help you read your favorite book even at night. It will be easier for you to study, write, embroider, or do any work at all that requires you to have a good lighting. 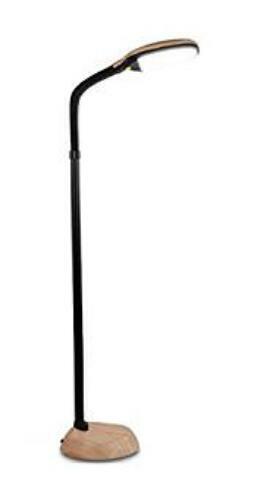 This kind of floor lamp will greatly assist you in every task and will not let you strain your eyes while doing your job. An example of a good floor lamp with natural lighting is the Kenley Natural Daylight Lamp. This lamp has an adjustable gooseneck arm so you can move it and focus the light while you’re doing your task. ♦ – Lamp is 63″ tall, cable is 6ft. With its 6400 Kelvin rating for color, you’ll get a light that is as bright as the afternoon sunshine. But don’t panic yet because even with a bright lighting capacity, it has a 27-watt energy saving bulb that can last you up to 8000 hours. This lamp is the perfect lamp for people who often work late at night and needs good lighting to get the job done. If you need to illuminate a really dark room, especially if you don’t have enough windows in your house, getting floor lamps that can give you a bright lighting is the best option. When you’re reading your book, bright white lights can help you prevent your eyes from squinting. A perfect floor lamp that can give you this lighting is the Brightech’s Contour LED Dimmable Floor Lamp. This is an industrial lamp that has a 3-pivot point which lets the user adjust its height and angle according to your liking and needs. 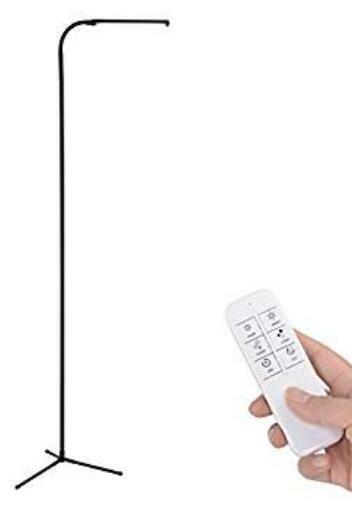 Turning it on or off is also as easy as 1-2-3 with a toggle switch. ♦ – The Contour LED beams with cool white light, yet never becomes too hot to touch. ♦ – Using only 8 watts, it yields over 90% in energy savings compared to energy-consuming incandescent bulbs. ♦ – Dimensions are 28.3 x 11.5 x 4.8 inches. (Note: Compatible with wall switches!) Above 4 feet in height, the Contour stands tall enough to reach over your desk. 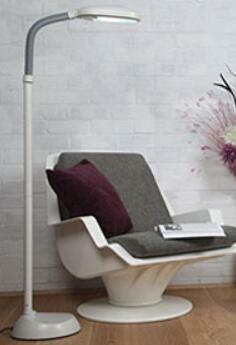 This kind of floor lamp is best for people who like a cool white light to illuminate a space. It can also last you up to 20 years because of its energy-efficient bulb that has 8 watts of lighting power. You’ll also have no problem decorating your home with this lamp because it has a silver finish that will give your home a modern but cozy ambiance. Lighting up a bigger room has never been this easy with a torchiere lamp. This kind of lamp is probably one of the most popular styles of lamp that you’ll find. It is stylish and can be used anywhere. It has a torch-like shape so the light is pointing upward. The name is actually derived from the French word of “torch” that explains why it is called a torchiere. Brightech SKY LED Torchiere Floor Lamp is a torchiere lamp that doesn’t just look fancy but also will give you a lot of features to give your home the best lighting. Since this lamp has an LED technology, it boasts a lifespan of more than 20 years and it will never heat. It’s also very easy to use as you can dim it with just a tap. This torchiere floor lamp bask in SKY’s warm white color, as the lamp itself stays cool. LED never overheats. SKY Torchiere provides super bright indirect lighting as it reduces your energy bill. This lamp can be used to light up a large room like your office, bed room, or living room with no help from a ceiling light. It has a warm white lighting color which is good for your eyes. Another bonus for this lamp is its rotating top and slender design. The rotating head feature will help you adjust it so you’ll have enough light in the areas that you want. This LED lamp will give you good lighting without too much heat that can make your room uncomfortable. Choosing the best floor lamps for your lighting need is easy. With these three lamps, you’ll have an idea which one is the best for your room. Their features are energy efficient and very convenient so you’ll have no problem with working even at night. Stop reading or working in a room with bad lighting because your eyes will suffer eventually, choose the right floor lamp now to make every task easier. Choosing the right floor lamp has become a challenge given the wide variety of options out there. Use the information below as a guide to the perfect floor lamp given your needs, tastes and preferences. 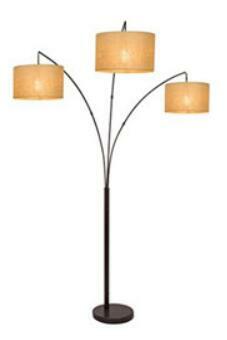 Floor lamps come in a wide variety as far as design and appearance go. When looking for the perfect floor lamp, it is important that you identify a suitable design and appearance. This is because the lamp should perfectly match the furniture and room décor of the space it is to be placed in. One of the main influencing factors of the level of aesthetic appeal associated with a floor lamp is its design. Floor lamp designs should be assessed from top to bottom. Starting from the base, you will notice that different floor lamps have differing bases. Traditional floor lamps come with a larger and heavier base, while contemporary lamps, which have smaller shades, come with smaller and lighter bases. The size of the base usually affects the stability of the lamp as well. The next floor lamp design aspect you should assess is the neck. This is the part that runs from the base to the lamp; it also houses the wire feeding electricity to the bulbs used. Although some lamps have a straight neck, others come with a curved one to ensure that the light is directed appropriately. Some designs even come with a neck that splits into a number of arms. Lastly we have the shade. Although most lamps come with a shade, this does not mean that you cannot change it for a more fitting design as per your tastes and preferences, to match the room’s décor. Another important consideration to keep in mind when assessing the appearance of floor lamps is the material used. Traditional floor lamps are made out of rattan and wood. These usually have a traditional and classic look. Metallic floor lamps on the other hand tend to have a contemporary appeal. ♦ – Durable construction, the acrylic crystals surprisingly look like real glass and don’t look cheapy. The lamp have dimming feature, it can put out a lot of light when on high, and a nice yellow glow on low. It gives off plenty of light when turned all the way up and lovely glow when low. When looking to purchase floor lamps, it is important that you consider your needs, or the requirements of the intended purpose. If you want to use the floor lamp in a living room, or large space requiring a lot of light, consider choosing torchiere style lamps. These lamps direct the light upwards, illuminating a larger space. On the other hand, if you want a floor lamp to be used in a bedroom, or any other area where you might also use it as a task light, for reading, consider purchasing a lamp that comes with adjustable arms so that you can direct the light appropriately. ♦ – Works well with LED or 60-watt CFL for a warm, serene feeling with no excess heat. 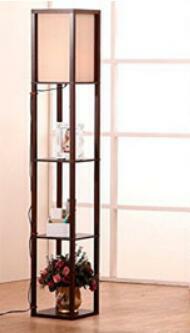 ♦ – 63-inch tall floor lamp in an authentic wood open-box frame has 3 flat-surface 10 ¼ -inch wide shelves. Each shelf measures approximately 15 inches long. This is a beautiful simple design and inexpensive. A 60 watt incandescent will barely light a room except as a mood light. It’s really more of a mood light, so might be tucked away near a chair, anyway – the shelves are sturdy enough for a mug of coffee, a book, etc. The drawback is that the shades for the lamp are very thick, so the light coming through is fairly dim. This is a beautiful light and well made, sturdy. It’s got a small footprint so people with little kids might want to tether it to the wall, like you would a bookcase, to prevent it getting knocked over. 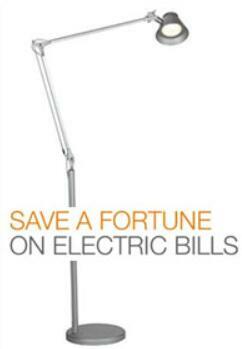 Floor lamps can be used to provide both ambient and task lighting. 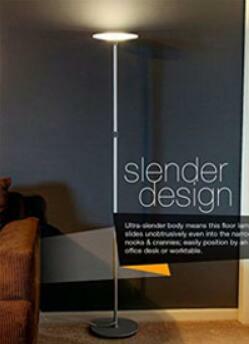 Your intended application will determine the type of floor lamp you should choose. 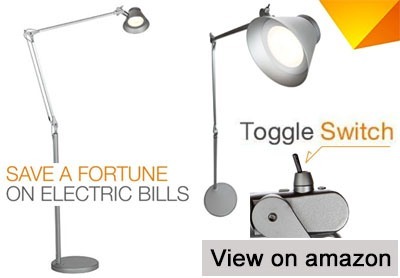 To increase the functionality of your lamp, choose one that comes with an adjustable height and shade. Furthermore, consider choosing a floor lamp that also comes with a dimmer switch so that you can be able to conveniently vary the amount of light it emits as per your needs. If you are looking for a floor lamp to be used for reading, consider purchasing one that has an easy-to-bend neck or arm. You should also fit a higher wattage bulb on the lamp. Darker shades on the other hand are best used on lamps meant to produce ambient lighting. Available in 5 colors dimming, this LED reading lamp complements pastels and neutral tones as well as vivid hues and patterns; pairs equally well with traditional wood flooring or more contemporary, industrial spaces. Assembles in 5 minutes. Lightweight design makes Litespan easily portable from room to room – beside a bed or next to your sofa. The cord is 6 feet. Also, the instructions do not address the “dimmable” feature at all. It is invoked by continuously pressing the on/off switch. Easy to find in the dark, the light switch stays lit as a mini-night light with a soft, unobtrusive amber glow. The flexible “goose-neck” section is very stiff, which is good for holding a position, but is actually so stiff that it can be difficult or impossible to position the lamp head exactly where you want it. Adjustable gooseneck lets you pivot lamp head up or down or side-to-side over a variety of hobbies or tasks from beading and crocheting to jigsaw puzzles. Heavy base prevents lamp from tipping over no matter what position the neck is in. This lamp is highly recommend to buy. When choosing floor lamps you will also have to consider its convenience of use. The lamp you end up choosing should achieve the intended purpose conveniently. The fact that floor lamps can be moved around and used for different purposes makes them highly convenient for use. 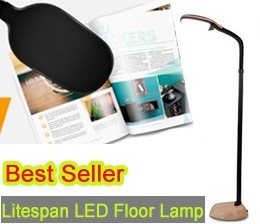 Other features influencing the level of convenience of use of a floor lamp include its ability to fold into a small package to facilitate easy storage where necessary; support for remote control and elaborate pull switches among others. If you like lamp like this, the Kihung Remote Control dimmable led floor lamp with 120 level adjustments is great choice. Other considerations to keep in mind when choosing the perfect floor lamps include the height and pricing. The height of the lamp you choose should perfectly match the height of the room it is to be used in. This lamp so sturdy & great quality! It has 3 settings for the bulbs for all the 3 lamp shades, you can have one, two or all three lights turned on together or separately! Convenient to split the arms so that you can enough to read comfortably for two person reading together. Great floor lamp, fits perfectly in our family room over the curved sofa. Although cost is often one of the chief considerations in any purchase, it is important that you remember to focus on the value of the lamp you end up buying. Remember that you only get what you pay for. With the above considerations in mind, you will have a better chance of choosing the perfect fit from the numerous options available out there.